The common language run time(CLR) is the virtual machine component of Microsoft’s .NET framework and is responsible for managing the execution of .NET programs. In a process known as just-in-time (JIT) compilation, the CLR compiles the intermediate language code known as Common Intermediate Language (CIL)into the machine instructions that in turn are executed by the computer’s CPU. The CLR provides additional services including memory management, type safety and exception handling. All programs written for the .NET framework, regardless of programming language, are executed by the CLR. It provides exception handling, Garbage collection and thread management. The CLR is Microsoft’s implementation of the Common Language Infrastructure (CLI) standard. What does it means when CLR is integrated into SQL server ? it will be compiled to the one common language—MSIL. The CLR is responsible for executing MSIL code. The CLR also manages the code that runs within it by providing the code with runtime services. Class Library support, error management, and debugging services create a consistent development environment for all .NET languages. distinguish between .NET code and native code (for example, code written using Visual Basic 6 or C++). Native code runs outside the CLR and is referred to as unmanaged code . Unmanaged code is not subject to CLR services, like code access security. Within SQL Server, all objects that use CLR integration are written as managed code. Extended stored procedures (XPs) are unmanaged code and are written using C++. The Base Class Library (BCL) is a standard library available to all languages using the .NET Framework. .NET includes the BCL in order to encapsulate a large number of common functions, such as file reading and writing, graphic rendering,database interaction, and XML document manipulation, which makes the programmer’s job easier. It is much larger in scope than standard libraries for most other languages, including C++, and is comparable in scope and coverage to thestandard libraries of Java. The BCL is sometimes incorrectly referred to as the Framework Class Library (FCL), which is a superset including the Microsoft. * namespaces. These are the namespaces that are standardized as of the ECMA 335 and ISO/IEC 23271:2006 standards. This namespace includes the core needs for programming. It includes base types like String, DateTime, Boolean, and so forth, support for environments such as the console, math functions, and base classes for attributes, exceptions, andarrays. Defines many common containers or collections used in programming, such as lists, queues, stacks, hashtables, and dictionaries. It includes support for generics. Provides the ability to diagnose applications. It includes event logging, performance counters, tracing, and interaction with system processes. Provides help for writing internationalized applications. “Culture-related information, including the language, the country/region, the calendars in use, [and] the format patterns for dates, currency, and numbers” can be defined. Enables reading from and writing to different streams, such as files or other data streams. Also provides a connection to the file system. Provides an interface “for many of the protocols used on networks today”, such as HTTP, FTP, and SMTP. Secure communication is supported by protocols such as SSL. Provides an object view of types, methods, and fields; and “the ability to dynamically create and invoke types”. It exposes the API to access the Reflective programming capabilities of CLR. Allows management of the runtime behavior of an application or the CLR. Some of the included abilities are interoperable with COM or other native code, writing distributed applications, and serializing objects into binary or SOAP. “Provides the underlying structure of the common language runtime security system.” This namespace allows security to be built into applications based on policy and permissions. It provides services such as cryptography. Supports various encodings, regular expressions, and a more efficient mechanism for manipulating strings (StringBuilder). “Provides standards-based support for processing XML,” including reading, writing, schemas, serialization, searching, and transforming. unless you can persuade the makers of SQL Server to test it for you. This unlikely event notwithstanding, you will have to use the unsupported library at your ownrisk. Unsupported libraries are not loaded by SQL Server by default, and therefore you have to register them explicitly. When using functionality from an unsupported assembly, you are responsible for testing it and ensuring it performs well, without affecting the stability of SQL Server. 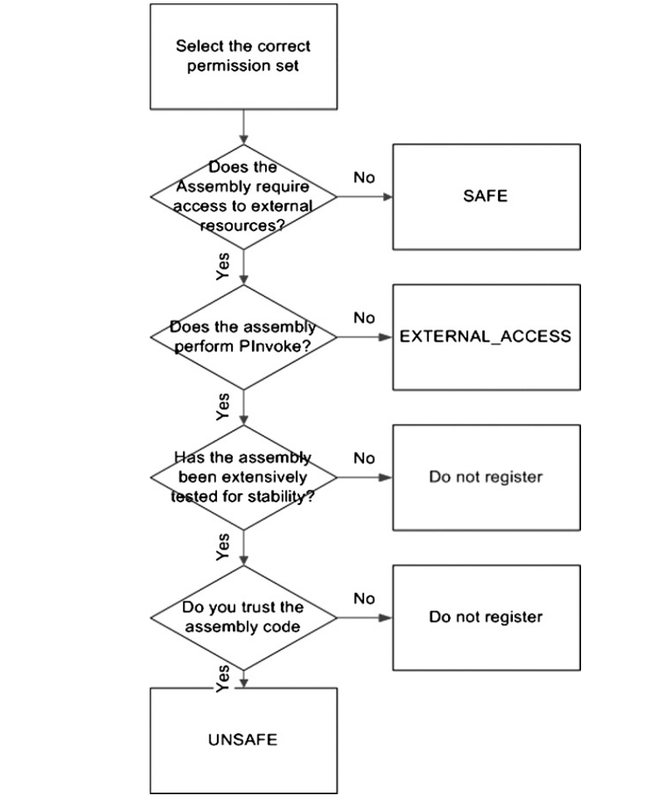 What is an assembly? and what is this to do with CLR Stored procedures, User Defined Functions, Triggers, User Defined Data Types ? These assemblies are stored external to SQL server and before you can use an assembly from SQL Server you must register it. When you register the assembly, it is imported into SQL Server and configured for use. Often assemblies depend on other assemblies, which in turn depend on others, and so on, forming a dependency tree. During registration, the entire chain of dependencies for your assembly must be imported into SQL Server. Machine policy: This is the policy that is in effect for all managed code running in the machine on which SQL Server is installed. User policy: This is the policy that is in effect for managed code hosted by a process. For SQL Server, the user policy is specific to the Windows account on which the SQL Server service is running. 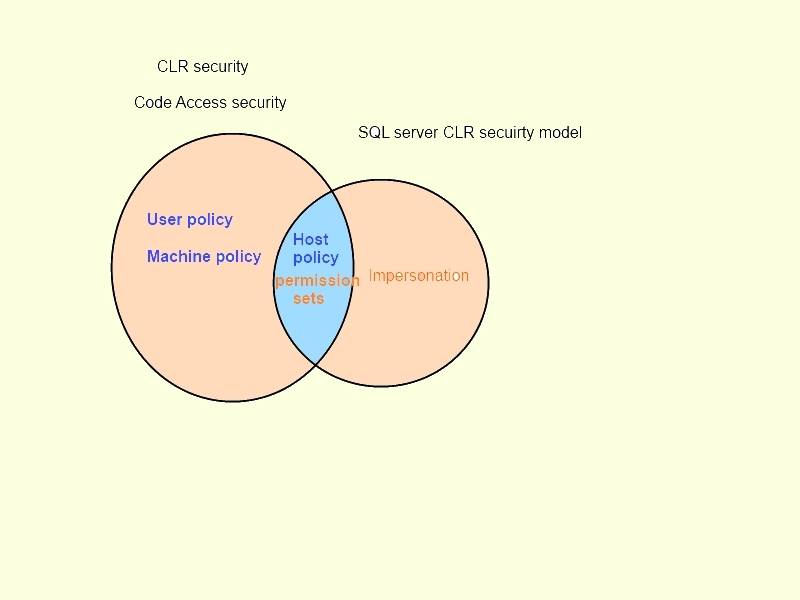 Host policy: This is the policy that is set up by the host of the CLR (in this case, SQL Server) that is in effect for managed code running in that host. How does CAS security works? SQL statement or another CLR object running in the server. The SQL Server host policy level is determined by the permission set specified when creating the assembly. SAFE: Only internal computation and local data access are allowed. SAFE is the most restrictive permission set. 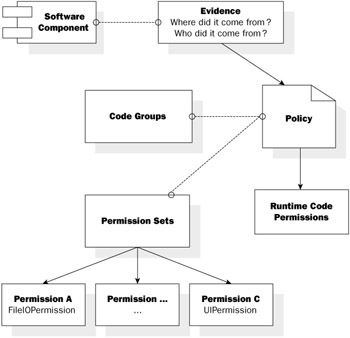 Code executed by an assembly with SAFE permissions cannot access external system resources such as files, the network, environment variables, or the registry, and this is the default permission set. If assembly is set to safe and during the execution if it tries to access external resources like file system or network , it will fail. HKEY_CURRENT_USER, HKEY_CURRENT_CONFIG, and HKEY_USERS registry keys. UNSAFE: UNSAFE allows assemblies unrestricted access to resources, both within and outside SQL Server. Code executing from within an UNSAFE assembly can call unmanaged code. The execution context corresponds to a SQL Server login. Attempts to access external resources are denied and a security exception is raised. The execution context corresponds to a Windows login and the execution context is the original caller. The external resource is accessed under the security context of the SQL Server service account. The caller is not the original caller. Access is denied and a security exception is raised. The SQL Server CLR integration security model is intended to govern code executing inside of SQL Server, and is intended to prevent elevation of privilege attacks against protected system resources from managed code. User-defined code can call other code inside of SQL Server, either in Transact-SQL or in one of the managed languages. The relationships between these objects are referred to as links. The three types of links are described in the following table. Invocation Corresponds to a code invocation, from a user calling either an object (such as a Transact-SQL batch calling a stored procedure), or a CLR stored procedure or function. Table access Corresponds to retrieving or modifying values in a table, view, or a table-valued function. Similar to invocation links, except they have a finer-grained access control in terms of SELECT, INSERT, UPDATE, and DELETE permissions. Gated between two objects Permissions are not checked across that relationship, once it has been established. FIX:OLE DB provider for linked server returned message “Query timeout expired”. Simple powershell script to Bulk Load csv into a SQL Server table.